A distant sonorous murmur rises in the west. Prisms shimmer in its ambient breeze, which is now blowing like a huge sibylline mass with its esoteric mysteries. “Quantum Cathedrals” begins “Horizon Matrix” with a gigantic sound wave knitted of interwoven layers which accumulate in a mosaic of tones and of contrasting colors. To help soften the gloomy presence behind this large stratum of evolving meditative ambient elements, Max Corbacho hangs on it some subtle astral hums which, along with the flickering prisms, ignite our interest in this titanic ambient movement that is barely changing within its sonic parameters. And the Spanish musician continues to blow the hot and the cold, leaving the listener the choice to select the transcendental essences that emerge from this opaque ambient movement. Gradually, we plunge into an even darker world around the 11th minute when the sound layers infiltrate the corridors of a dark cave. The breezes become cavernous, but always comforting. Prism glow is still blazing, bringing this meditative nuance of Asian countries to those 28 minutes which end in a whirlwind of tranquility. 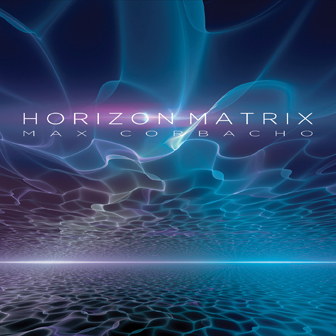 No surprises or disappointments, “Horizon Matrix” remains in the continuity of the works of Max Corbacho. Possibly darker than Nocturnes II, the music flirts with that degree of wisdom which characterizes the universe of multilayered landscapes of the Spanish synthesist that has the gift of making our imaginations travel between the borders of the cosmos and of the esotericism. So, there are no surprises here, except for the delicious organic texture that responds to the ambiences of “Into the Ocean of Time”. The rest? Pure ambient music where the absence of rhythms is compensated by the gregarious mutations of a herd of sonic shadows which moves with a sluggish slowness, giving Max Corbachotime to paint them with colors which change according to our perceptions. More vibrant and definitely more aggressive in the choice of its meditative hue, “Temporal Horizon” is a torrent of scarlet magma which sticks to our eardrums. The color of the moods is constantly changing with a vision of the underworld and another more pastoral, with a fine perfume of organ mass, bickering the 15 minutes of “Temporal Horizon”. The bickering remains a bit the same in “Beyond the Light Storm” which displays the most beautiful colors of occult ambiences with layers of voices and of synth in more pastel colors. After the intense tide of buzzing winds in “Into the Ocean of Time”, “Gravitation Memory” ends “Horizon Matrix” with another intense push of multilayered breezes which exhale breaths as dark as translucent. Sand dust scrapes the in-between of these diaphanous plates and further digs the initiatory flap which animates the atmospheres of this album which travel between the cosmos and the colors of our imagination.